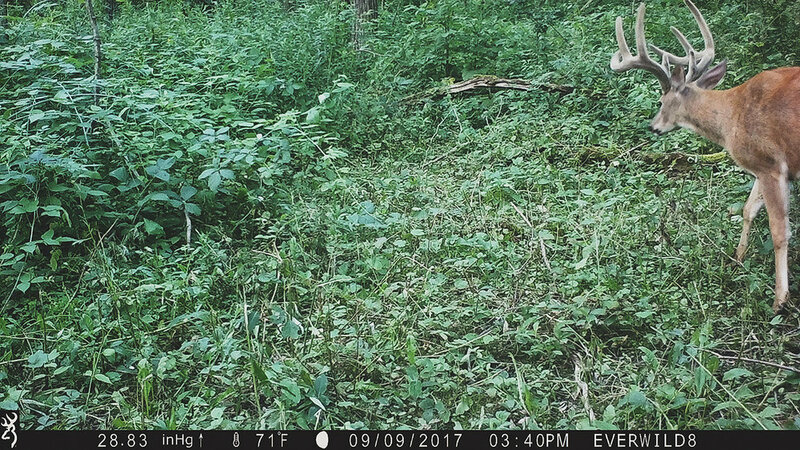 Having found a new core bedding area via trail camera recon (photos below) we are now closing in on exactly how this section of property functions and we are stoked for the postseason and the chance to move cameras into this area and establish precise buck bedding locations. However, we still have the ENTIRE NY deer season in front of us and we now know that we have a prime buck bedding location nailed down adjacent to an area the local does bed in. As we continue to work on peeling the layers off that scenario we will ramp up our mock scrape game using our cameras to tell the story of these locations. This year we are adding into our equation several rubbing posts with overhead licking branches where we will begin to test the waters of the local big boys and hopefully provide ourselves another late October/early November tool for our arsenal. As all these fellas begin to take on their fall ranges and each personality begins to show we become probably a little to eager as we wait for the right time to make our next card pull, but hey, this stuff is what its all about. Care to keep up with what the EverWild Crew is up to, sign up and we'll be sure your the first to know! EVERWILD COPYRIGHT 2016 - ALL RIGHTS RESERVED.